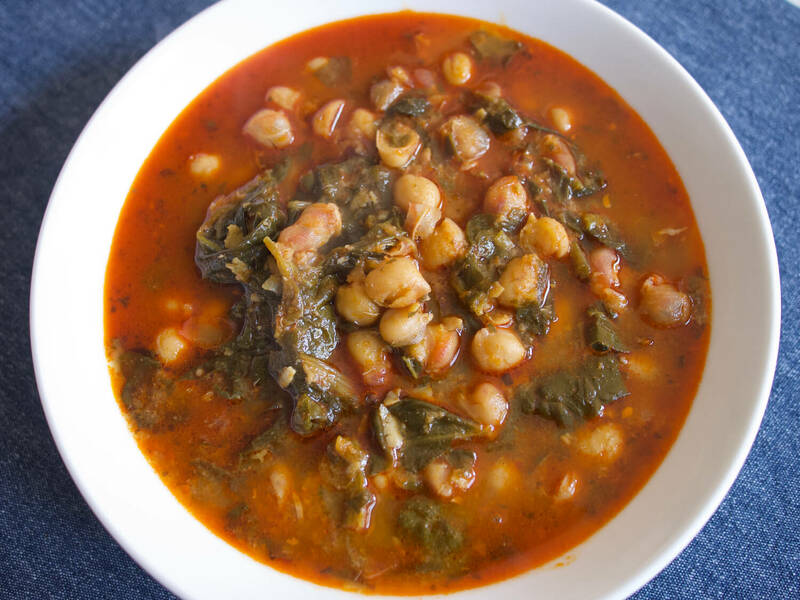 The magic of this stew comes from the combination of spices - sweet, smoky, and slightly bitter - as well as from the slow-cooked chickpeas that create their own luxurious broth while they simmer. Saffron adds a subtle hint of fragrant Spanish flavor, but if you don't have it on hand, the stew is still excellent without. Rounding out the rich flavor is a classic Spanish technique that uses a bread and garlic paste to thicken the stew. Make the chickpeas: drain and rinse the soaked beans and place in a medium-large saucepan. Add carrot, celery, garlic, onion and a generous pinch of salt. Cover chickpeas and vegetables with 8 cups of water and bring to a boil. Reduce heat to low and simmer until chickpeas are creamy and tender, about 2 hours. Remove from heat and use a slotted spoon or tongs to remove vegetables, keeping the chickpeas in the liquid. The liquid should just barely cover the chickpeas - if there’s excess, remove with a spoon or ladle until you’ve reached that level. Heat a small pan over medium-low heat and add ¼ cup olive oil. When oil is warm, add 6 cloves peeled garlic and brown, stirring occasionally, about 3 minutes. Do not go deeper than a nice golden brown, as garlic will begin to taste bitter. Remove the garlic from the oil and set aside. Add the bread to the oil and brown on both sides, 1-2 minutes per side. Remove the bread and set aside. Remove saute pan from heat and add sweet paprika, smoked paprika, saffron, and cumin while stirring to prevent spices from burning. Add sherry vinegar while stirring - the vinegar may bubble and steam a bit. Set saute pan aside. Add browned garlic and toasted bread to a mortar and pestle or mini-food processor and smash or process to a thick paste. Place the pot containing the chickpeas back over medium heat and bring to a simmer. Ad the spinach and simmer for 5 minutes. Add the spice mixture from the saute pan, followed by the bread and garlic paste. Simmer for another 5 minutes to create a thickened stew. Season to taste with salt and pepper and serve immediately. Serves 4. Adapted from José Andrés.